Iran’s foreign minister is deriding as an “arts and crafts show” Israel’s visual-aid-enhanced accusation that his country is keeping a secret atomic warehouse. Bangladeshi Prime Minister Sheikh Hasina is accusing Myanmar of failing to honor a verbal commitment to take back Rohingya Muslims who fled a military crackdown there. She appealed for more international support for the 1.1 million Rohingya sheltering in Bangladesh and urged an “early, peaceful solution” to the crisis. Hasina said there have been three bilateral “arrangements” between Bangladesh and Myanmar for the repatriation of Rohingya, but Myanmar authorities have yet to accept them back. Myanmar denies committing atrocities but the top U.N. human rights body is setting up a team to collect evidence of alleged crimes that one day could be used to prosecute suspected perpetrators. Vietnam’s prime minister has spoken at the U.N. General Assembly as the U.N. flag flew at half-staff to honor his country’s late president, who died days before the annual gathering of world leaders. Prime Minister Nguyen Xuan Phuc took the podium Thursday. He thanked the assembly for holding a moment of silence for President Tran Dai Quang last Friday, shortly after he died in Hanoi at age 61. A government doctor said Quang had a rare viral illness he hadn’t revealed. Quang was buried Thursday in his home village. The prime minister asked the gathered nations to support his country’s bid for election to the U.N. Security Council for 2020-2021. Vietnam was a member in 2008-2009. Small island nations are using the weeklong gathering of world leaders at this year’s U.N. General Assembly to highlight the one issue that threatens their existence: global warming. Speaking shortly after U.S. President Donald Trump — whose fiery speech made no mention of climate change — Seychelles President Danny Faure said for his country it’s already a daily reality. The Indian Ocean nation is one of dozens of Small Island Developing States, or SIDS for short, that are at risk of being washed over as rising temperatures make the oceans rise. Haiti’s President Jovenel Moise urged rich countries Thursday to stick to their pledges under the 2015 Paris accord, which includes financial aid for vulnerable nations to adapt to and mitigate the impact of climate change. Ardern’s remarks Thursday also called for a recommitment to multilateralism — both on principle and because, as she said, “In New Zealand, going alone is not an option.” And she said that climate change is an important example of why cooperation is imperative. The state TV report said Iran is committed to nonproliferation and Iran’s nuclear program is under surveillance of the U.N. nuclear watchdog. The response came after Netanyahu’s speech Thursday at the U.N. accusing Iran of concealing more nuclear activity from international partners. Israel sees Iran as its biggest threat. Iran denies seeking nuclear weapons. Israeli Prime Minister Benjamin Netanyahu is accusing European nations of “appeasing” Iran by trying to renew trade despite Iran’s nuclear activity. Netanyahu invoked historical European maneuvering in the Middle East while excoriating European leaders for sticking to the 2015 Iranian nuclear accord. It allows for a lifting of sanctions in exchange for curbing Iran’s nuclear activities. He made the announcement at the U.N. General Assembly, where he spoke out strongly against the 2015 Iranian nuclear accord. Palestinian President Mahmoud Abbas will chair a vast group of developing countries at the United Nations, in a boost to his efforts for official Palestinian statehood. Members of the Group of 77 formalized the decision to give Palestine the chairmanship of the group in 2019 at the U.N. General Assembly on Thursday. Abbas welcomed the decision and urged other world leaders to recognize Palestine as a state. Israel strongly objects to the move. The group promotes the interests of the 135 developing countries it represents at the United Nations, including China. Egypt is the 2018 chair. Palestinian President Mahmoud Abbas is vowing that his people will not revert to violence despite growing anger over Israeli and U.S. policy. Abbas rejected sole U.S. mediation in Mideast peace efforts because of President Donald Trump’s decisions to recognize Jerusalem as Israel’s capital and withdraw aid funding for the Palestinians. Speaking Thursday at the U.N. General Assembly, Abbas urged Trump to rethink the decisions and urged member nations to support his push for Palestinian statehood. But Abbas pledged not to revert to violence despite his accusations that Israel and the U.S. have not held up promises to the Palestinians. Abbas spoke after months of tensions between Israeli forces and the Islamic militant group Hamas that rules Gaza. Abbas uttered the words as soon as he took the podium Thursday, even before his customary invocation of God and laying out the overall situation for the Palestinians. Abbas spoke from the podium the day after U.S. President Donald Trump suggested for the first time as U.S. president that he “liked” a two-state solution as the most effective way to resolve their conflict. The Palestinians welcomed the offer but remain deeply angry over Trump’s decision to recognize Jerusalem as Israel’s capital and to stop funding for the U.N. agency aiding the Palestinians. Israeli Prime Minister Benjamin Netanyahu is scheduled to speak soon after Abbas at the U.N. gathering. Haiti’s president says increasingly violent hurricanes are exacerbating problems in extremely poor countries like his and is urging world leaders to do more to tackle climate change. For example, he said Hurricane Matthew in 2016 caused damage in Haiti equivalent to 32 percent of gross domestic product. He said that aggravates deep poverty and social tensions even as he tries to pull Haiti out of its chronic troubles. He urged countries and companies to follow through on promises made in Paris last year to help vulnerable countries to adapt to climate change. Many world leaders at the U.N. General Assembly also called for more action by rich countries to help poor ones cope with flooding, drought and other extreme weather. Macedonia’s president is criticizing top U.S. and EU officials for backing a referendum on changing his country’s name. He criticized U.S. and EU officials who have visited Macedonia in recent weeks for suggesting that the name change offers Macedonia’s only hope of ever join NATO and the EU. “If you take our hope, what will we be left with?” he asked. U.S. and Europe officials have accused Russia of interfering against the name change. Ivanov spoke Thursday at the U.N. General Assembly. The leader of the Mediterranean island of Cyprus is criticizing short-term moves to lock up migrants and is urging world leaders to work together on a global migration strategy instead. 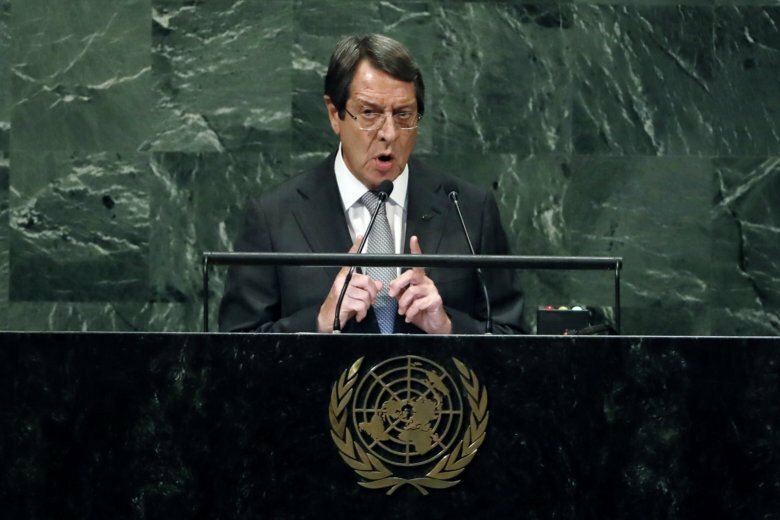 President Nicos Anastasiades made his appeal Thursday at the U.N. General Assembly, where many leaders have spoken out about the challenges of mass migration flows. He called on leaders to set aside conflicting interests and “reverse our policies of political expediency and … address the root causes that have led to this unprecedented situation” such as hunger and war. He spoke as the European Union is deeply divided over how to deal with migrants coming from Africa and the Mideast seeking asylum or a better life. Israeli and Palestinian leaders are preparing to take center stage within an hour of each other at the U.N. General Assembly. Their speeches come a day after Donald Trump suggested for the first time as U.S. president that he “liked” a two-state solution as the most effective way to resolve their conflict. Also on the docket at the U.N. is a Security Council meeting chaired by the American secretary of state that will focus on North Korea and its nuclear program. Trump met Wednesday with Israeli Prime Minister Benjamin Netanyahu and told reporters he believes that two states — Israel and one for the Palestinians — “works best.” He has been vague on the topic, suggesting he would support whatever the parties might agree to.